Summary: Frances Irvine, left destitute in the wake of her father’s sudden death, has been forced to abandon her life of wealth and privilege in London and emigrate to the Southern Cape of Africa. 1880 South Africa is a country torn apart by greed. In this remote and inhospitable land she becomes entangled with two very different men—one driven by ambition, the other by his ideals. Only when the rumor of an epidemic takes her into the dark heart of the diamond mines does Frances see her road to happiness. Review: Two straight up historical reads in three days? What is going on with me? Haha, coincidentally, I had two historical novels to read for tours that were happening three days apart. So I read two back to back! I don't even remember the last time I read a book from these genres, so I was very surprised by how much I enjoyed them! After her father's death, Frances is left to figure out where to go next in life. Her only option appears to be marrying her cousin, where she will have to leave her privileged life in 1880s London to move to South Africa as the wife of a doctor. When she finally arrives after quite an interesting voyage across the ocean, Frances isn't prepared for the destitute and hardships of life in Africa. With small pox on the rise among the natives working for the greedy diamond miners, Frances' husband seems to only care about saving the natives from a horrible epidemic. Feeling more alone than ever, Frances has to figure out how to live and survive a world she's never, ever known. I don't know much about the diamond mining industry in Africa in 1880, but it seems to be a very scandalous time according to Frances life there. I was so intrigued with the whole affair, both from the point of her doctor husband who was an advocate for the natives' rights and the horrible mine owners who would do anything to get even more money, no matter how many natives died. There was so much secrecy and scandal, and Frances found herself smack dab in the middle of it. The history was huge asset of this book, but when it came to the characters, I wasn't too big of a fan of them in the beginning. Frances appears to be very whiney, dependent, and helpless all throughout the book. She completely misreads people and situations she's in, so I couldn't help but become very annoyed with both her emotions and actions. At the end, though, I did realize that these aspects of her character are very deliberate in how she's supposed to learn and grown throughout her experiences in the novel. While that makes her character more bearable, I hated how she completely misread people when it was obvious to me as a reader the nature of their character. I don't wan to spoil too much, but the way she felt about the two men in her life made her appear completely naive and childish. She never took the time to stop thinking about herself for a second and really get to know the people that enter her life. Even though Frances annoyed me throughout the story, I still loved her journey and the world she entered as she left London for South Africa. 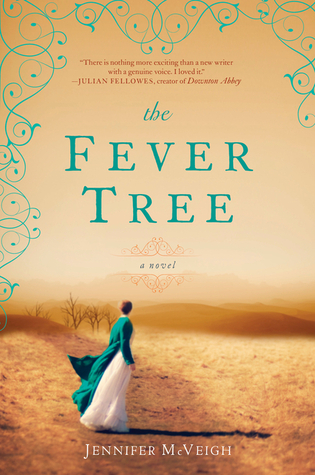 The Fever Tree is so rich with history and forces its character to grow up as they face the real world beyond their privileged little bubbles in London society.